Tom Kostopoulos and Andy Chiodo both spent the start of their careers basking in the adoration of Wilkes-Barre/Scranton Penguins fans. Both players quickly earned the favor of the team’s supporters and became fan favorites, but it was the 2004 Calder Cup Playoffs that the two cemented their legacies with the team. As Kostopoulos and Chiodo were winning over Penguins fans with their play on the ice, that was around the same time that the fans carved out a special place in the players’ hearts, too. Chiodo says he can still hear the earth-shaking cheers of the Wilkes-Barre/Scranton faithful ringing in his head. Their careers eventually veered in different directions following that run to the 2004 Calder Cup Final, but Kostopoulos and Chiodo are back together again on the Pittsburgh Penguins hockey operations staff. 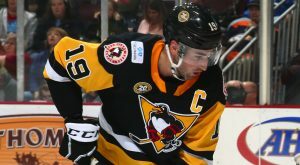 On Wednesday, the long-time Penguins captain, Kostopoulos, was hired by Pittsburgh as Player Development Coach, and Chiodo was named Goaltending Development Coach. In a way, Kostopoulos was an extension of the Penguins’ development staff for years. Wearing the “C” in Wilkes-Barre/Scranton while playing on an American Hockey League contract, Kostopoulos and Pittsburgh had a mutual understanding that even though the veteran still wanted to score as many goals and win as many games as he could while his playing career was still active, he was to mentor the younger players and help prepare them for the next step in their careers. By all accounts, Kostopoulos thrived in that role as a leader (and his offensive production rarely waned during that time, too.) Current Pittsburgh stand-outs such as Jake Guentzel, Matt Murray, Conor Sheary in addition to likely future studs like Dominik Simon and Teddy Blueger all have been vocal advocates of Kostopoulos. Given his success with helping talented players reach the National Hockey League as a locker room leader, it’s easy to understand why everyone in Pittsburgh felt that Kostopoulos would be a perfect fit as a development coach. The man himself agrees with that assessment, too. Chiodo’s playing career didn’t last quite as long as Kostopoulos’ epic 19 seasons, but he had already carved himself out a niche as a broadcaster in Toronto before stepping into a coach’s role last year. After one season with the Ontario Hockey League’s Ottawa 67’s, Chiodo departed to rejoin the organization that gave him his start in pro hockey. The Wilkes-Barre/Scranton fan darling plans on using his experience as goaltending coach with the 67’s in his new role with the black and gold. Kostopoulos and Chiodo’s jobs will take them across the continent, following draft picks and other prospects in the professional, collegiate and junior hockey ranks. Part of the appeal of the position is that you’re not quite as fully inundated in as season as one would be as a player. This made it attractive to Kostopoulos, who has made it perfectly clear that he wants to spend time with his family in retirement. Furthermore, Kostopoulos, Chiodo, and Pittsburgh’s other development coach, Jarrod Skalde, are all based out the greater Toronto area. 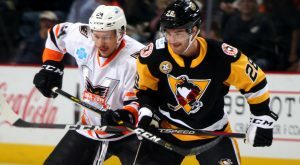 They won’t have to go far to congregate and discuss Penguins prospects and their progress, and Kostopoulos can still be close to home for his kid’s soccer game or a family movie night. Of course, the job also requires frequent visits to Pittsburgh, Wilkes-Barre/Scranton and Wheeling. Kostopoulos and Chiodo will mostly be confined to the press box and coaches’ offices, but if you happen to cross paths with one of them in the halls of Mohegan Sun Arena at Casey Plaza, feel free to say hello. Even though they’re hockey ops now, they still feel the connection made as players with Penguins fans.